We link with Woodhey High School, with a National Cookery Competition, Youth Speaks & we also interview all the ones going onto College of Uni. On the 22nd June Ramsbottom Rotary hosted the annual “Youth Speaks” competition at the Red Hall Hotel. 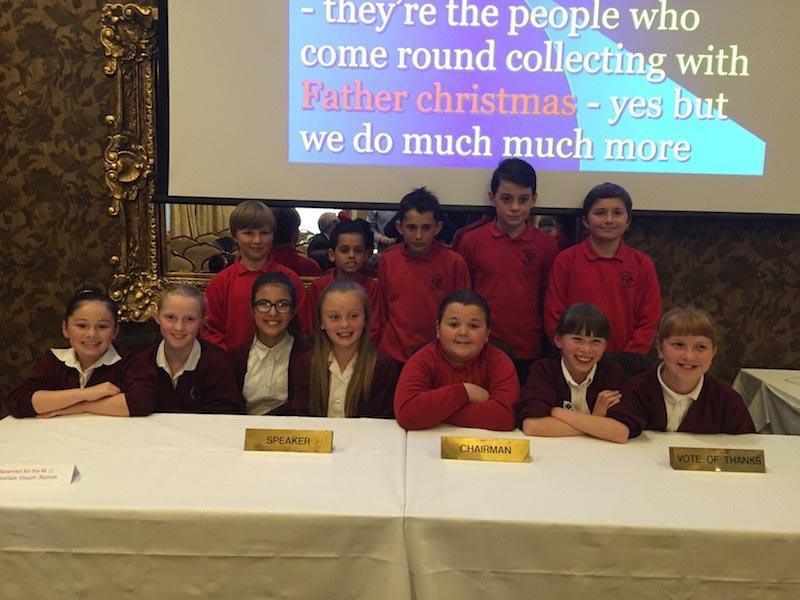 Family, friends and teaching staff supported the participating schools, Holcombe Brook and Edenfield primary as they entered teams of year 6 pupils to present their favoured topics. The teams of three were, Chairperson, Speaker, and proposer of Vote of thanks. The speaker has six minutes in which to present their chosen topic. The topics were, Roller Coasters, The Robinwood Activity Centre, Heroes in Sport and finally Nelson Mandela. The two Adjudicators former Head Teachers Frank Bennett of Woodhey High School and Jon Lovgreen of Castle Brook High School both spoke highly of the quality of the teams, their research and presentation was a credit to both the teams and the schools. Rotary’s aim is to give the pupils an opportunity to prepare, present and deliver to an adult audience.